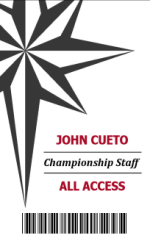 These are some of our favorite credential samples from past events. 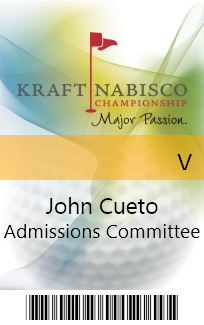 Each event can have an unlimited number of templates and each template can include a variety of graphics, photographs, text and 3D effects. This All Access sample shows a background image matching the event's theme and a graphical cell phone flag. Thanks to the Kraft Nabisco Championship. 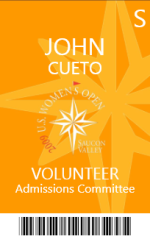 This Admissions Volunteer sample shows a vector background, partially transparent objects, a graphical cell phone flag and uses standard letters to show access levels; in this case, V grants access to the Volunteer Headquarters. 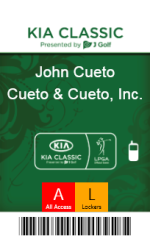 This All Access sample shows a background image matching the event's theme, a graphical cell phone flag and uses colored blocks with letters and descriptions to show access levels. Thanks to the KIA Classic Presented by J Golf. 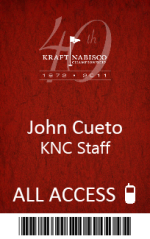 This Admissions Volunteer sample shows a background image matching the event's theme. 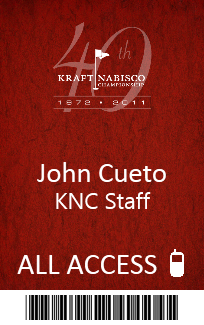 This All Access sample shows a background image matching the event's theme. 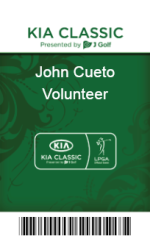 Thanks to the 2009 U.S. Women's Open. 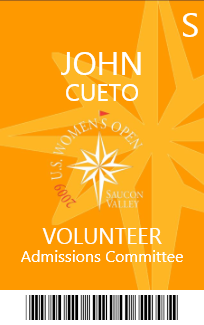 This Admissions Volunteer sample shows a background image matching the event's theme and standard letter-based access levels.